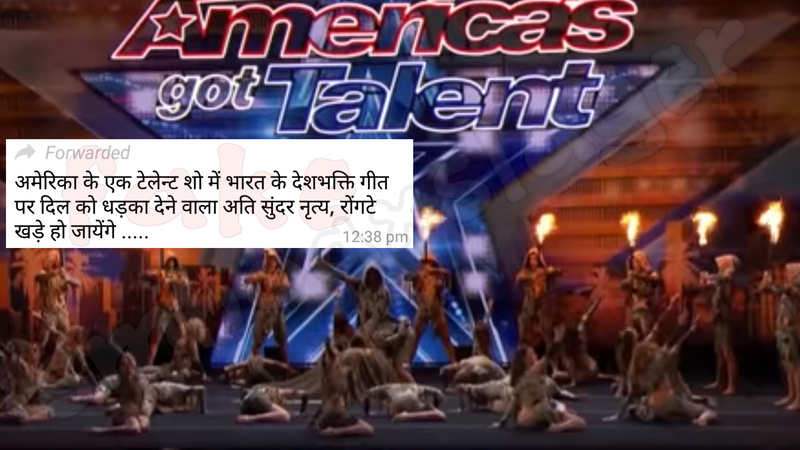 A video claiming to show a dance group in a talent show performing to a patriotic Indian song has gone viral on social media platforms. The song in question is ‘Sandese Aate Hain’ from the movie Border. The song is also accompanied by a recorded message, which talks about the ‘unity in diversity’ of India. It asks people who call India an intolerant country to listen. अमेरिका के एक टेलेन्ट शो में भारत के देशभक्ति गीत पर दिल को धड़का देने वाला अति सुंदर नृत्य, रोंगटे खड़े हो जायेंगे ….. The video is being circulated on Facebook. No denying to the fact that watching such a spectacular dance to our song, that too based on Indian Army give goosebumps but unfortunately it’s not real. The Indian Hindi song “Sandeshe aate hai” has been added by editing the video and is not part of the video. The actual song was different. The dance group in the video is known as Zurcaroh, an acrobatic show group based in Austria. They competed in Season 13 of America’s Got Talent, which aired from May 2018 to September 2018. They appear in Episode 1 of the season. The performance was globally appreciated. Tyra Banks presses ‘America’s Got Talent’ Golden Buzzer too. #अमेरिका के एक टेलेन्ट शो में #भारत के #देशभक्ति_गीत पर दिल को धड़का देने वाला अति सुंदर नृत्य, रोंगटे खड़े हो जायेंगे …..
Did AIIMS doctor pay respect to Late Shri Vajpayee like this ? August 17, 2018 Hoax Slayer Comments Off on Did AIIMS doctor pay respect to Late Shri Vajpayee like this ?